Nontawat Numbenchapol's Boundary, a documentary about the disputed Preah Vihear Temple in Cambodia, will be screened in Bangkok from tomorrow. The film is politically sensitive: last month, the Ministry of Culture announced that it had been banned, though two days later they performed a suspicious U-turn, explaining that the earlier announcement had been made by an unauthorised sub-committee. A cut was required before the film was eventually approved by the Ministry of Culture: background audio of a crowd chanting "Long live the king!" at a New Year countdown was muted. Inexplicably, the film received a restrictive '18' rating. Unable to secure regular theatrical distribution, Nontawat has been forced to negotiate with cinemas independently, selling tickets personally in the lobby of each venue. 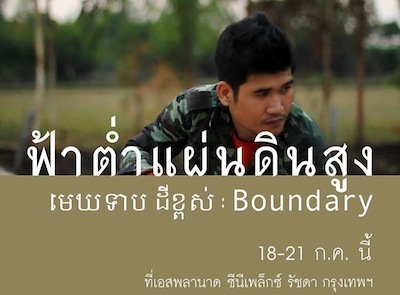 After screenings upcountry earlier this month, he is bringing the film to Bangkok's Esplanade cinema for four days, from 18th to 21st July. Nontawat will be present for a Q&A after each screening; he took part in Freedom On Film last month. 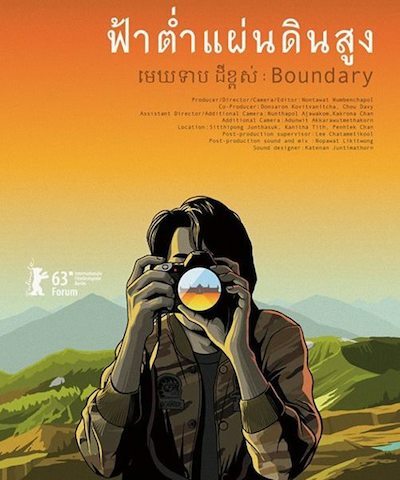 Boundary is composed largely of silent, still sequences depicting the serenity of rural life, as a counterpoint to the fierce border dispute surrounding the temple. Nontawat begins by interviewing Aod, a young soldier, in his home village. Idyllic sequences of novice monks bathing and Aod's father fishing are contrasted with Aod describing his military conscription and the army's crackdown against the red-shirts. After footage of the Thai military firing at their Cambodian counterparts near Preah Vihear, we see damage to houses and a school close to the temple, caused by bombs and gunfire from Cambodian troops. Finally, at the end of the film, Nontawat's camera explores the temple itself, the ruined Khmer compound that has caused such bloodshed and ultra-nationalism in the past few years. The sensitivity surrounding Boundary follows the equally controversial political documentary Paradoxocracy, whose release was similarly delayed. Paradoxocracy was screened at Esplanade and Paragon, though incredibly the cinemas actually discouraged customers from seeing it: screenings were not advertised or listed online, and callers were told that the film was unavailable.